That’s a pretty lawless Town you have there Mayor McGarvey, or so it would seem based on the annual policing costs for the Town of Parry Sound. Or is it? Can so many seniors cause so much of a ruckus? Or is it like one of those old Westerns where the cowboys come in and shot up the town frightening the horses, the women and the children? Let’s look at the numbers to try and understand what’s going on. It’s worth reading the two preceding posts on this subject (OPP Policing Cost Reductions – No Windfall for Parry Sound in 2015, and Law and Order – Parry Sound Edition (Part 1)) to get the background on policing costs in Parry Sound and make sense of what’s discussed below. 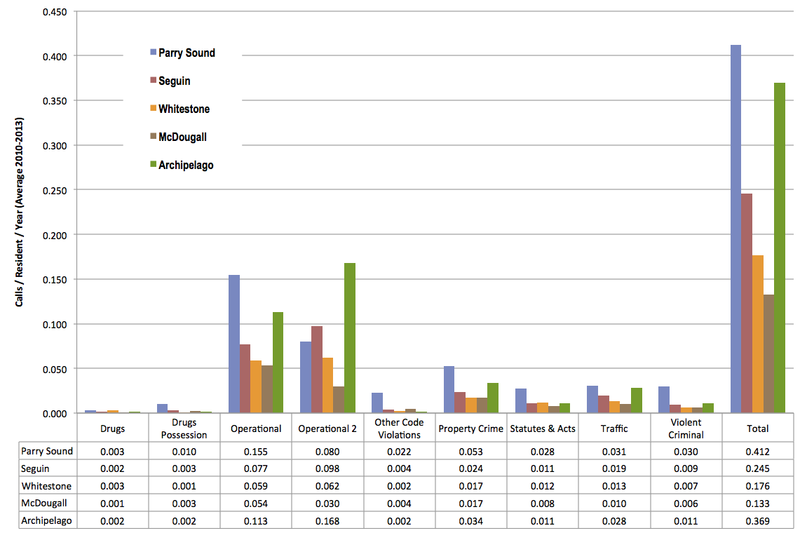 And here is the annual trend from the Parry Sound Council package. This data does not however take into account the difference in permanent populations for the various municipalities. 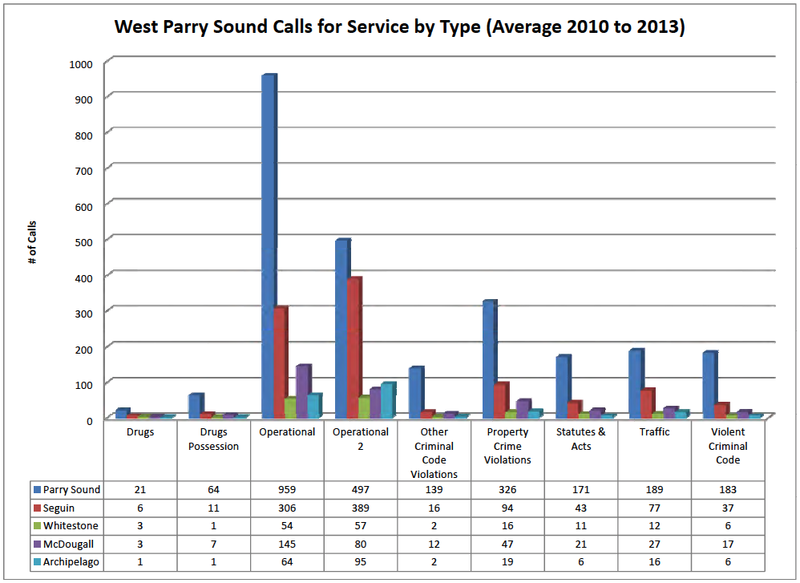 It’s not unexpected that Parry Sound would have the largest number of Calls for Service given that it has the largest population, 6,191 versus 3,988 for Seguin, 2,705 for McDougall, 918 for Whitestone and 566 for the Archipelago. If we factor in the populations and calculate the Calls for Service by Permanent Resident we get a more nuanced sense of the relative ‘lawlessness’ of the various communities. On a per resident basis the Archipelago is a close second! But I guess it really is the ‘Wild West’ out on the islands in November with the wind and the waves. 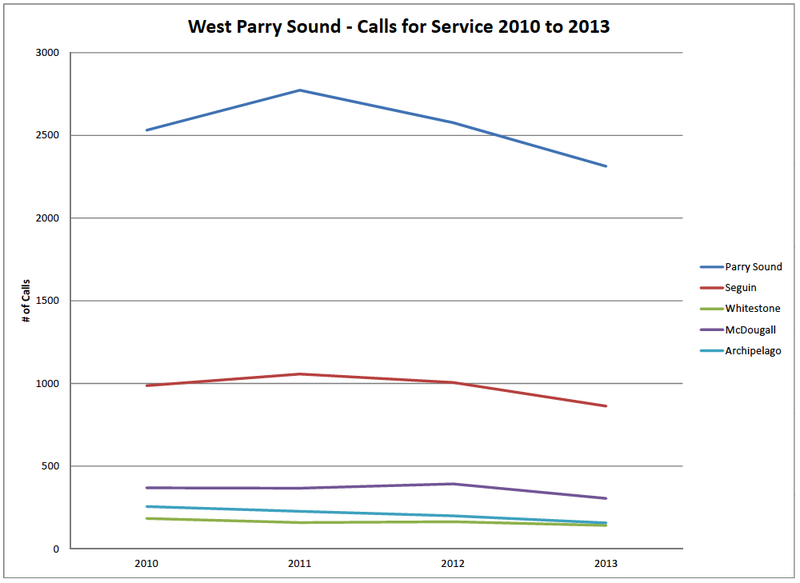 In terms of Calls for Service per resident Parry Sound leads the way followed by the Archipelago, Seguin, Whitestone and then McDougall. 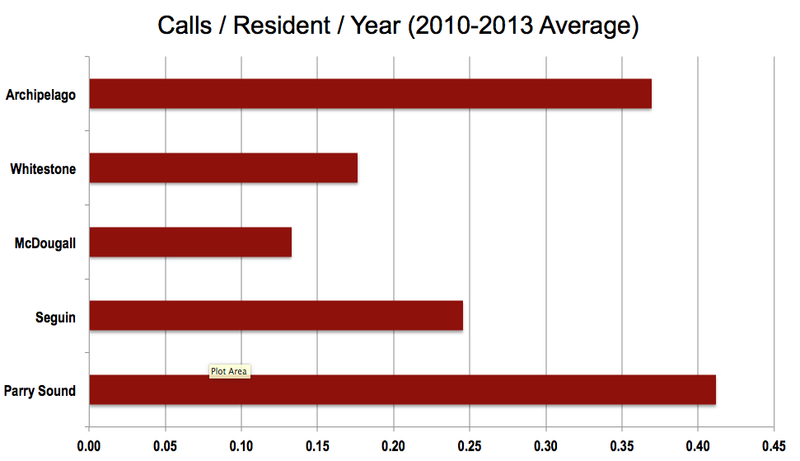 It gets more interesting if we look at the Calls for Service per Resident, by the various call categories. This is similar to the chart included in the Council package but is adjusted for population. There are a few interesting tidbits that pop out from the data and become more obvious when displayed graphically. Parry Sound pretty much leads in each of the categories with respect to Calls / Resident except for “Operational 2”, those soft ‘fill out the timecard’ type calls. Even Seguin leads Parry Sound in this category, but of course this is the ‘cheapest’ category in terms of ‘cost per call’. (See this earliest post for costs by category.) But there is no difference between Parry Sound and Whitestone in terms of “Drugs”, but then Parry Sound has the populace to consume but not the land to produce. “Property Crime” in the Archipelago is also close to that of Parry Sound. What tickles my fancy is seeing that Parry Sound and the Archipelago are pretty much tied for “Traffic” Calls for Service on a per resident basis. I don’t think the Archipelago has any roads. So I suspect that this relates to boating safety enforcement and accident investigation in the great Georgian Bay Biosphere that is contained within their boundaries. There may also be some snow machine stuff as well. And I’ll bet most of the calls have nothing to do with Archipelago residents but rather ‘transients’ and ‘visitors’, a part of the reason for Parry Sound’s higher policing costs. The information has been sliced and diced to provide insights and a little bit of entertainment. What’s to be made of the information in terms of being a Parry Sound resident? Are there opportunities to reduce policing costs? Policing costs can and will be reduced as the full impact of the new OPP costing model is implemented over the next five years. That will help quite a bit and allow Parry Sound to allocate funds to other priorities. There is no question that as you squeeze people closer together, as you do in a town, there will be more friction between individuals. This leads to confrontation, and the need for a referee. That seems to be one of the most important roles the OPP plays in Parry Sound; look at the Operational calls and what they include. Statutes & Acts is another area where people really should turn to the Town for support or a referee, but it’s easier and more dramatic to ‘Call the Cops’. It would be nice to see a reduction in Drugs and Crimes, but I guess that is part of human nature and what is seen in a town that represents the local urban centre for the District. These sorts of offenses seem to migrate to urban centres where there is more opportunity to ‘do business’ and ‘hide the evidence’. And at the same time there is more opportunity to be seen and reported. So how do I feel about public safety in Parry Sound? Great! There is no sense that it is dangerous to walk in any part of the town at any time of the day, nor does there seem to be any worry about break-ins. Having a tight neighbourhood is perhaps the best way to ensure property safety. If we can get past the reflex action of calling the police if the neighbours are too noisy, or the kids are walking across the backyard, or we’ve lost something, it’s likely our costs can go even lower. But I won’t bet on that happening, so we’ll pay a bit more and just enjoy living in a safe and tidy little town where the Canadian Shield meets Georgian Bay.